When the sir—rugby speak for referee—whistled that final game blow, I left the pitch expecting to see devastated looks. Maybe even some tears. But instead there were hugs. Our friends and family were cheering as loudly as they could. And most importantly, there wasn’t a sad rugger in sight. Despite losing the biggest game of our season, we were truly so proud to have made it so far. 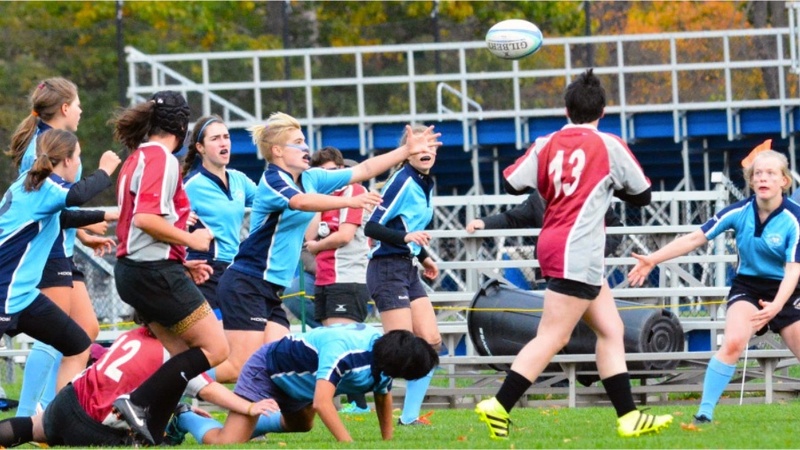 Last year, MHC rugby won barely half of its games. But this year, we won nearly all of them. 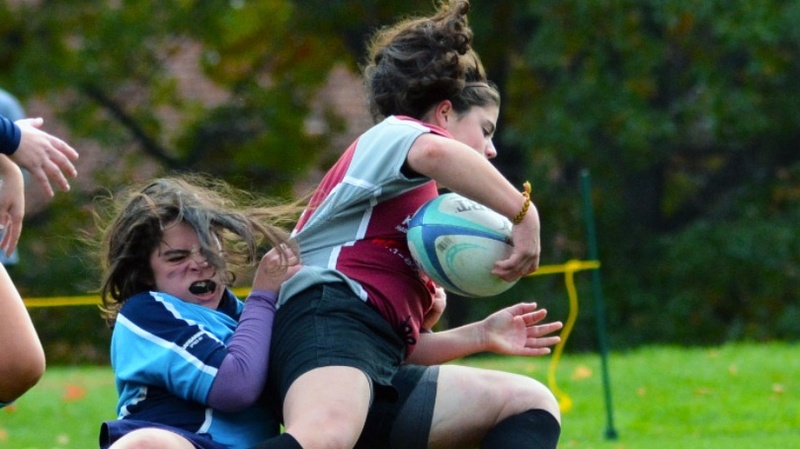 Because rugby is a club sport, the willingness to play comes out of passion. There is no contract to sign, promising to be at every practice and game. There is no one to set up the pitch for us before games—or even to drive us to games. We do it all ourselves, for no other reason than because we want to. We step up to lead, organize, and run the team we love. 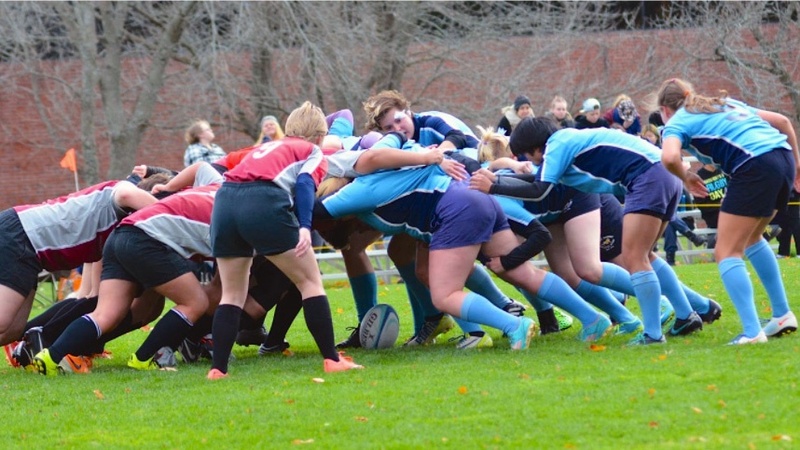 Although I played many sports in high school—soccer, bowling, and track—being a part of MHC rugby feels different. This experience has taught me what being on a team is all about, both on and off the pitch. After games we socialize, bonding with other teams as well as our own. Each new member of our team is paired with a big sibling and inducted into a mini rugby family, which is our way of officially welcoming rookies to the team. We also have craft nights, movie nights, and a host of traditions that you have to see to believe. My favorite is the annual scavenger hunt, which pits rugby families against one another as they race all around campus to complete whatever is on the list. MHC rugby is all about a little friendly competition! Fun stuff aside, we work our butts off on the pitch. We practice five days a week year round, except for a small hiatus or two. Fall is our main season, when we play for the conference championship. But we also have games in spring, including the biggest rugby tournament in the northeast—the appropriately titled Beast of the East—and a highly anticipated game against Smith, our biggest rival. Playing year round may sound daunting. But as a club sport, missing a practice here or there is no problem—whether you have a big paper due, there’s a test right around the corner, or you simply aren’t feeling up to it that day. So long as you get to three practices a week, you are eligible to play in that week’s game. What does practice entail? You’ll run. You’ll tackle. You’ll ruck. And you’ll scrum! If you want to know what all those words mean, come check us out sometime. There are no tryouts. 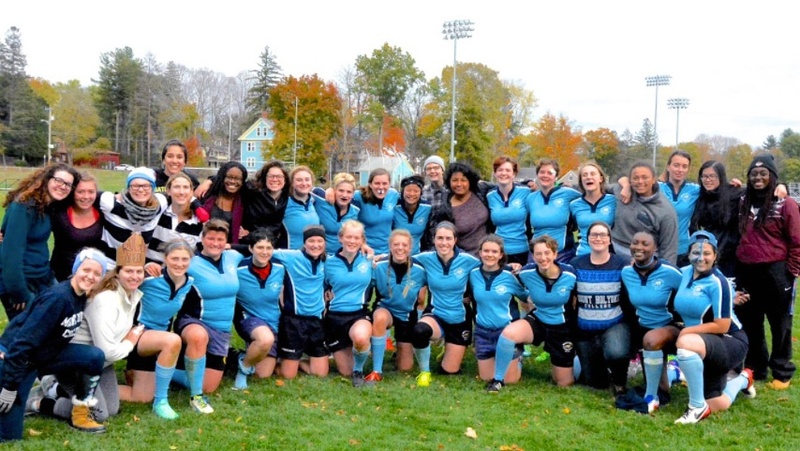 Just show up to a practice and we’ll show you how to be an MHC rugger. Learning how to play rugby, a form of football, isn’t easy. But our head coach works with the two team captains to teach the game, configure practices, and make us the best team we can be. One of my favorite things about rugby is that it attracts people of all shapes, sizes, and backgrounds. No matter if you’ve never played a sport before in your life, or if you’ve been playing rugby since you could hold a ball, you’ll find a place on our team. About 95 percent of the people who join our team have never played rugby before, including me! I joined during my first semester at MHC. From the strength and speed that my dad saw in me from my soccer days, he always thought I’d be a great rugby player. So I decided to see if he was right. I’m more than a little glad that I did. Rugby is a physical game. But it has also strengthened me in so many nonphysical ways. I’ve learned to keep my head up after literally getting put on the ground time and time again. I’ve gained confidence and leadership: I was once someone who would only speak when spoken to. Now I’m cocaptain of our team. With my sights set on the future. Which includes next year, when you can bet that we’ll be back at the New England Collegiate Rugby Cup, playing for the trophy once again. We might win, we might lose. But either way, we will stand together, side by side. Because that’s just what MHC rugby does. 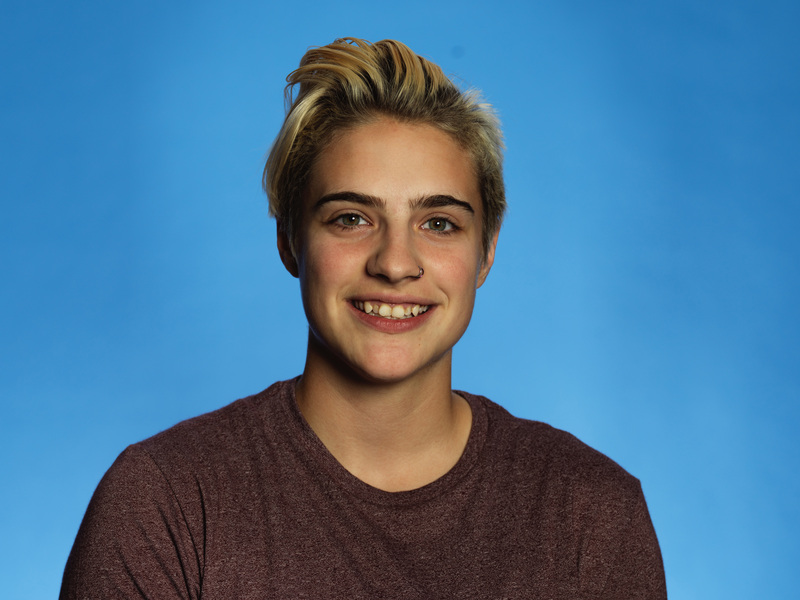 Liz Tucksmith ’19 hails from Chatham, New York. Tucksmith majors in computer science, works as a digital content assistant for the Office of Communications and Marketing, and is cocaptain of the MHC rugby team.